The sun did not shine, it was too wet to play. So the 2013 Infiniti M37 Sport sat in the driveway all that cold, cold wet day. The winter storms persisted, lasting longer than most, pelting with rain for a week, the Southern California coast. No photos were taken, the Infiniti was a mess, and it proved quite difficult to find dry roads for this test. Yet the moment I slipped behind the wheel and placed the selector in gear, I had decided this Infiniti is one of the better luxury sport sedans on sale this year. OK, enough with the Dr. Seuss. Let’s get down to business. 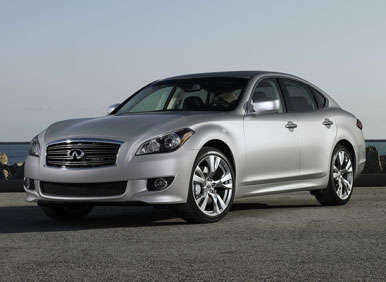 The Infiniti M is the luxury brand’s flagship sedan, one that competes in the heart of the luxury sedan market. Buyers can choose from a number of models including the M35h, M37, M37x, M56, and M56x. 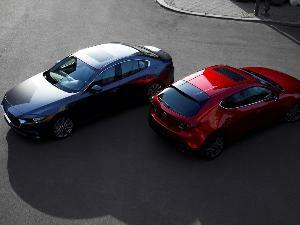 The M35h is a gas/electric hybrid model, the M37 is equipped with a V-6 engine, and the M56 is equipped with a V-8 engine. 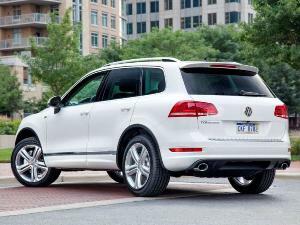 Models without the “x” designation are rear-wheel drive, while models with the “x” designation have all-wheel drive. Key standard equipment for the 2013 Infiniti M37 ($49,095 including the $895 destination charge) includes leather seats, Japanese Ash wood trim, dual-zone automatic climate control, Infiniti Intelligent Key with push-button ignition, Bluetooth connectivity, and a power sunroof. 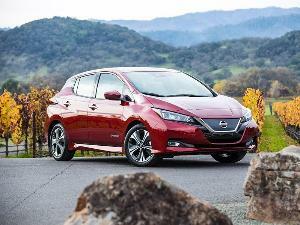 Options are offered in packages, and all of them first require the purchase of the Premium Package ($4,200). The Premium Package adds a navigation system, real-time traffic and weather reports, a Bose premium sound system, Infiniti Connection telematics service, ventilated front seats, a heated steering wheel, and rear parking assist sensors. Good luck finding an M37 that does not have this option. Once the Premium Package is purchased, M37 buyers can choose the Deluxe Touring Package or the Sport Package, but not both. The Deluxe Touring Package ($3,900) adds semi-aniline premium leather, White Ash silver powdered wood trim, a simulated suede headliner, upgraded cabin materials and stitching, a Bose Studio Surround audio system, a Forest Air climate control system, and a power rear sunshade. 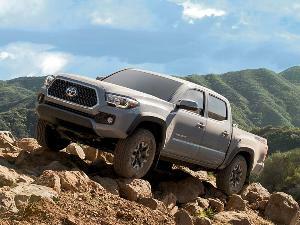 The Sport Package ($3,750) includes 20-inch aluminum wheels, performance tires, a sport suspension, sport brakes and, on rear-drive models, 4-Wheel Active Steer technology. Additionally, this package contains front sport seats, magnesium paddle shifters, aluminum pedal accents, a sport steering wheel and shift knob, and revised front styling details. 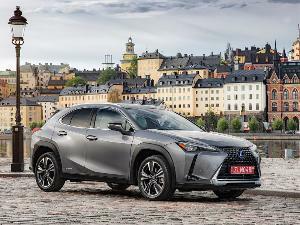 To this, buyers can add a Sport Touring Package ($2,000), which supplies the Bose Studio Surround audio system, the Forest Air climate control system, and a power rear window sunshade. Models equipped with the Premium Package and the Deluxe Touring Package can also be upgraded with a Performance Tire & Wheel Package, which adds the 20-inch wheels and tires from the Sport Package. This is how my Moonlight White example of the M37 was equipped, for a total price of $61,845. In addition to these option packages, the M37 can be upgraded with numerous accessories installed by the Infiniti dealer. Because the 2013 Infiniti M37 is rear- or all-wheel drive and positioned as a mid-luxury sport sedan, its closest competitors include the Audi A6 3.0T, the BMW 535i, the Cadillac CTS, the Jaguar XF 3.0, and the Lexus GS 350. Additional models within the M37’s theoretical competitive set include the new 2014 Acura RLX, the Hyundai Genesis, the Lincoln MKS, the Mercedes-Benz E350, and the Volvo S80 T6 AWD. 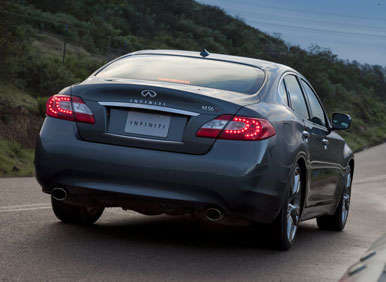 When it is equipped with its optional 20-inch wheels, the Infiniti M37 looks sensational, well balanced and in proportion. Smaller wheels make it look a bit pudgy and overweight. Obviously, I recommend the 20s. 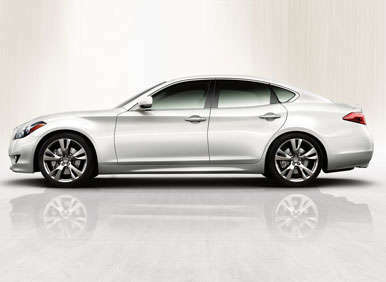 However, as attractive as the M37 might be, it also looks too much like a Nissan. It isn’t hard to see where Altima and Sentra stylists took their inspiration for the latest iterations of these family sedans, and while the similarity serves to elevate the mainstream models, it has the simultaneous effect of cheapening the Infiniti’s appearance. Nevertheless, the M37 is an extremely appealing vehicle, far better looking in person than it is in photos or as depicted in Infiniti’s online car configurator. 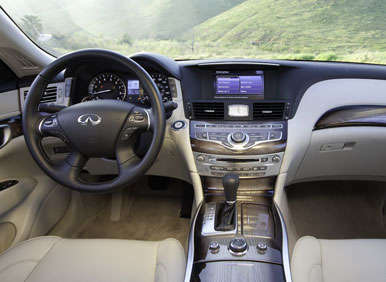 The 2013 Infiniti M37’s interior, with few exceptions, exudes quality. The materials, especially the upgraded semi-aniline Java-colored leather in my test car, look and feel terrific, and the heated and ventilated front seats are easily positioned for optimum support. The power tilt/telescopic steering wheel is comforting to grip, and the controls fall readily to hand. If there’s anything to complain about, it’s a thin center armrest pad. Better yet, when sitting in the driver’s seat, the view over the M37’s hood is almost sensual, not dissimilar to that of a Porsche, with clearly visible headlamp fairings and a center hood swell as voluptuous as Sofia Vergara. At night, this landscape is silhouetted against the glow of the headlights, giving the Infiniti M a distinctive feel from behind the wheel. Rear seat comfort would be good if the rear seatback angle didn’t force occupants to slouch, and great if rear side window sun blinds were included in one of the upgrade packages. Had the sun been out during our week with the car, my young daughters’ eyes would have gone unprotected from waning winter light. While some might find the array of controls on the Infiniti M37’s dashboard to be confusing, I don’t mind them, especially if the alternative is counter-intuitive or unresponsive technology. Perhaps Infiniti could group some of the secondary functions in a touchscreen menu to clean things up a bit, but I’d rather have this type of layout than something utterly befuddling like Cadillac’s CUE. That said, I must ask: Why is there space in the center console dedicated to an ashtray? That should be a flocked bin designed to hold a smartphone, an iPod, change, or something useful. Few smokers actually use the ashtrays in their vehicles, preferring instead to pitch butts out of their windows. The M37’s trunk is roomy enough at 14.9 cu.-ft., but the material lining it looks and feels too inexpensive for this caliber of automobile. 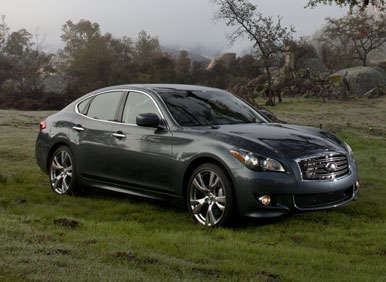 Six airbags, traction and stability control, 4-wheel ventilated-disc antilock brakes with brake assist, and rain-sensing wipers are standard on every Infiniti M. The Premium Package, with which nearly all Infiniti M37s in stock at the local dealership are equipped, adds rear parking assist sensors. 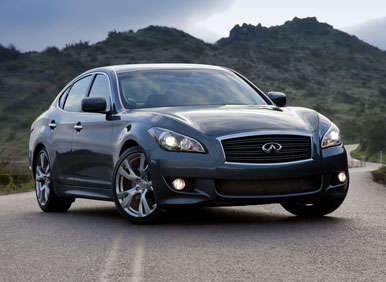 Upgrade the M37 with the Technology Package, and it adds every safety feature Infiniti holds in its arsenal. This option includes a Blind Spot Warning and Blind Spot Intervention system, a Lane Departure Warning and Lane Departure Prevention system, Intelligent Cruise Control, Distance Control Assist, Forward Collision Warning, Intelligent Brake Assist, an Adaptive Front Lighting System, and Front Pre-Crash Seatbelts. 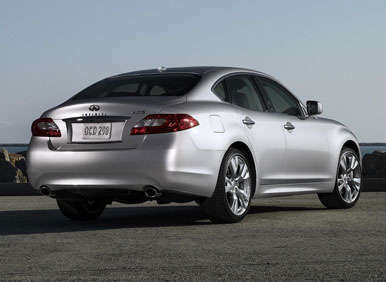 According to the NHTSA, the 2013 Infiniti M37 rocks a 5-star overall crash-test rating, the best one possible. The Insurance Institute for Highway Safety named the M37 a “Top Safety Pick” in 2012, but that rating had not been carried forward for the essentially identical 2013 model when this review was written. 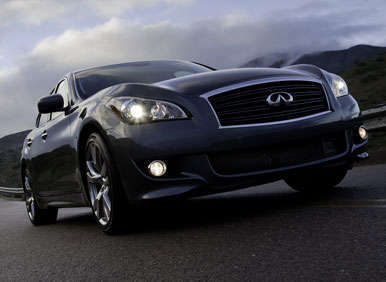 The Infiniti M37 is equipped with a 330-horsepower, 3.7-liter V-6 engine. A 7-speed automatic transmission with Adaptive Shift Control and Downshift Rev Matching delivers motive force to the rear wheels or, if the car is wearing an “M37x” badge on the trunk lid, all four wheels. Using the Infiniti Drive Mode Selector, the driver can choose between Standard, Sport, Snow and Eco driving modes, with throttle response and transmission shift points calibrated accordingly. Models with the optional Technology Package also have an Eco Pedal that actively pushes back against the driver’s foot to encourage more fuel-efficient driving. I drove my M37 test car with the powertrain in Sport mode, and averaged 20.9 mpg in a mix of city and highway travel. That’s almost exactly what the EPA led me to expect, thanks to a city rating of 18 mpg, a highway rating of 26 mpg, and a combined rating of 21 mpg. The Infiniti M37’s V-6 engine is an exceptional power plant, feeling much stronger than its horsepower and fuel economy ratings might suggest. The 7-speed automatic transmission is, for the most part, satisfying. On occasion, it matches revs when downshifting with a bit too much zeal and, on occasion, resists upshifting when it would be preferable. The M37’s brakes are excellent, providing fast, drama-free stops combined with outstanding pedal feel. 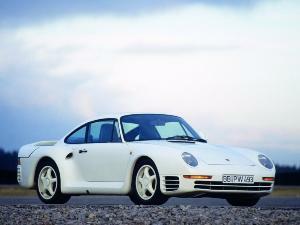 And my test car didn’t even have the Sport Package and its performance braking components. Suspension tuning is on the taut side – again, without the sport suspension tuning included in the Sport Package – but the M37’s standard setup does a good job of isolating pavement unpleasantness without filtering too much road feel. Tire grip, the few times I was able to really toss the M37 through a corner, proved impressive thanks to my test car’s Performance Tire & Wheel Package. Still, there is a sense when driving an M37 equipped with the Technology Package that perhaps God really is your co-pilot. Every once in awhile the M37 would correct course by itself, and brake a little harder than expected. The corrective actions I detected were so subtle that I wasn’t entirely sure anything occurred, which is as it should be. However, the sense that a self-correcting car leaves in a driver who enjoys the journey as much as the destination is unsettling. Dynamically, the M37’s steering is, by far, the least enjoyable aspect of the car. When driven in parking lots, in cities, and on the freeway, it offers satisfying heft at higher speed and extra levels of assist at lower speed. This is fine. But when a sport sedan like the M37 is used as one, the steering is the most critical communication point between man and machine, and my Infiniti spoke nothing but gibberish. When driving the one serpentine road I found to be relatively dry and free of fresh rockfall after days of steady rain, the M37’s steering felt heavy, leaden, like it was fighting against me, or like it had lost power assist, or like the front tires had gone flat. Whether this characteristic is an unpleasant by-product of the Technology Package or not, my strong recommendation to Infiniti is to get this corrected ASAP. 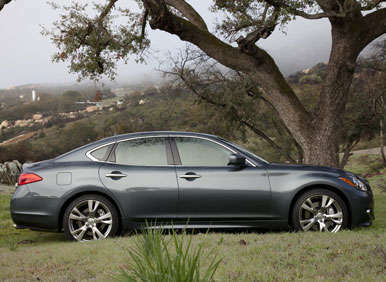 I thoroughly enjoyed my time with the 2013 Infiniti M37, except when steering it on local mountain roads. This car exudes quality in most respects, is extremely comfortable for front seat occupants, and looks terrific inside and out. The engine is thrilling, braking and handling is outstanding, and I would absolutely buy one of these myself. Except for that steering.